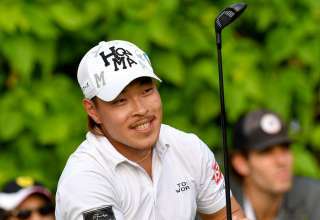 Asian Tour number one Gavin Green believes that his outstanding long iron play will give him an advantage at this week’s SMBC Singapore Open over the notoriously tough Serapong Course at Sentosa Golf Club. The first Malaysian to win the Asian Tour Order of Merit, Green said he will tackle some of the longer holes with confidence given his ball striking. “I’ve played here a few times and I was leading at some point too (last year),” said Green, who was second at the halfway mark before faltering in the third round. 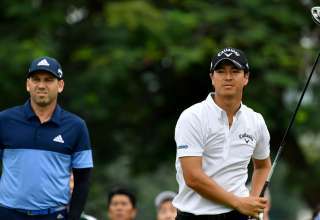 The big-hitting 24-year-old enjoyed a stellar 2017 that saw him record his maiden win on the Asian Tour and finish runner-up three times. Given his new standing in the game, Green admitted there will be more pressure on him to perform in 2018 but feels he is up to the challenge. “There are obviously more expectations and pressure. 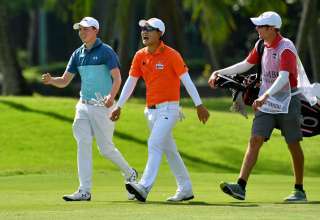 I have to practice harder and step up my mind game as well,” said Green, who teamed up with Japan’s Yuta Ikeda to win their fourball and foursomes ties for Asia at last week’s EurAsiaCup in Kuala Lumpur. Green shared the podium at today’s press conference with Singapore hope Quincy Quek, who experienced a memorable four days at last year’s SMBC Singapore Open. The sleep-deprived new dad gave some truth to the “nappy factor” in sport by fashioning two fine rounds to lie joint fourth at the halfway mark. 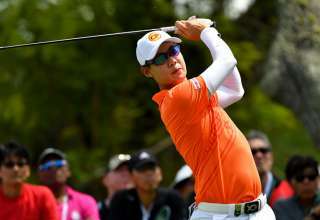 Quek, who had little shut eye and practiced sparingly after his wife Celine gave birth to their first child, Olivia, on the Saturday before the tournament, eventually finished as the leading Singaporean, in tied 26th spot. “Last year was memorable for me. It was quite a messy few days leading up to the event. I was sleeping in the hospital ward with my wife and baby,” said Quek, who is one of 10 Singaporeans in the elite field. Quek said that he loved playing the SMBC Singapore Open and he was looking for another good outing in front of the home fans. “When SMBC are the title sponsors of the tournament, the event has been done really well and the turnout has been really good. I look forward to playing in front of the home crowd,” he commented. The SMBC Singapore Open, which also features Major winners Sergia Garcia, Louis Oosthuizen and Y. E. Yang, will be played from January 18-21. The tournament is joint sanctioned by the Asian Tour and the Japan Golf Tour Organisation.